If you have previously received hair transplants or are considering undergoing hair transplantation surgery to restore your thinning hair, you likely have plenty of questions. There are a lot of myths surrounding balding and genetic hair loss with frustratingly few answers and plenty of deceptive products on the market. At Carolina Hair Center, Dr. Cooley has made it his mission to help those facing male and female pattern baldness restore their hair and increase their self-confidence. Hair transplants are a treatment option that requires plenty of patience but produces lifelong results. During hair transplantation surgery, healthy follicular units are harvested from donor sites along the sides and back of the scalp and then transplanted to balding and thinning areas. 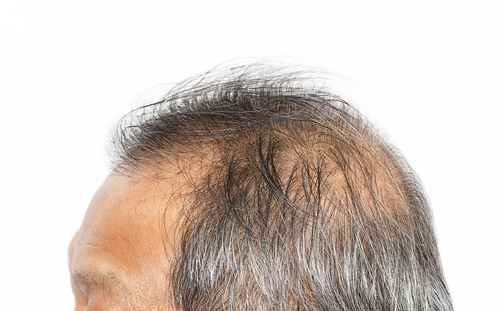 For men, follicular units located on the sides and back of the scalp are immune to the effects of male pattern baldness, also known as androgenetic alopecia. These balding-resistant follicles can be harvested and grafted to areas on the top and front of the scalp, where aging and genetics have stripped the scalp of its hair. Women can also undergo hair transplantation surgery, although they do not benefit from alopecia-immune donor sites like men. Women do not typically have to worry about going completely bald, but the follicular units on the sides and back of their scalps will thin along with the tops of their heads. For women facing a widening part or a thinning hairline, hair transplantation surgery can be completed in much the same way, although fewer women than men are good candidates for hair transplants. While the healthy follicular units settle into their new locations, they will not immediately begin producing hair. In fact, the newly transplanted follicles will actually shed their hair two to three weeks after surgery and enter a resting period for around two or three months. Once the scalp has healed and the hair follicles leave their resting phase, true results begin to develop. Patients can expect to see noticeable results around six months after their surgery. New hair will continue to come in for 12 to 18 months, at which point final results will be visible and patients can enjoy their new, thicker hair. Once hair transplants have completely healed and begun to produce thick and healthy hair, the results will endure for many years to come. Because the grafts are taken from parts of the scalp that are immune to balding, they will not be affected by any future hair loss. However, preexisting hair surrounding the grafts will still be affected by genetic hair loss. In order to best maintain your results, plan on supplementing your hair transplants with hair loss medication and treatments to keep the hair you still have. Hair transplants can restore hair to balding areas of the scalp, but it does nothing to prevent more hair from falling out in the future. If you are interested in hair transplants or have questions regarding your upcoming appointment, call Carolina Hair Center today at 704-729-7337 to learn more.